"Better to let them [working class children] drop the foreign language requirement and do a BTEC in how to claim the dole instead. (I'm not making that last qualification up, by the way.) That's not "elitist". Oh no. That's "inclusive"." "I am not making this up" is one of those much-used phrases which always seems to tempt fate. Sadly, the claim it is attached to is not always as accurate as the person making it seems to think. "Under the last government there were courses that were regarded as equivalent to GCSEs. For example - I am not making this up... a course in Personal Effectiveness which actually involved learning how to fill out a benefit form." But does it bear any resemblance to the reality? In July Full Fact touched upon the issue and found calling the course one "in how to claim the dole" was highly exaggerated. So what are the details? The course in the dock here is, as David Cameron states, the Certicificate of Personal Effectiveness (CoPE). The CoPE is a nationally-recognised qualification awarded by the curriculum development organisation ASDAN. It is made up of three levels - achieving the first is considered equivalent to GCSE grades E/F, the second equivalent to GCSE grade B, and the third earns 70 UCAS points. But that's where the 'benefits' theme stops. In fact, this task on the course isn't even compulsory - it shows up as one of ten tasks in Section A of Module 1 of the course. Neither the section nor the module are compulsory either. The course as a whole offers 12 modules, each of which has three sections and several tasks in each. It's inappropriate to describe the CoPE as a "course in claiming benefits" given that the reference in question is one optional task of one optional section of one optional module. That's not to say it isn't legitimate to question the value of the course. Similar optional tasks involve "As part of a group... entertain a number of people to tea or coffee" and learning traditional board games, which the Mail took exception to in its 2010 coverage. "to develop and demonstrate a range of personal, key and employability skills leading to personal effectiveness." The organisation also pointed out that earlier this year the qualifications regulator Ofqual scrutinised the personal effectiveness qualification in response to media criticism back in 2010. ...We found that both qualifications have been correctly levelled and they provide sufficient opportunities to meet the level descriptor set out for Level 2." Whatever your opinion of the value of the Certificate of Personal Effectiveness may be, it is a gross exaggeration to call it a qualification in claiming benefits. 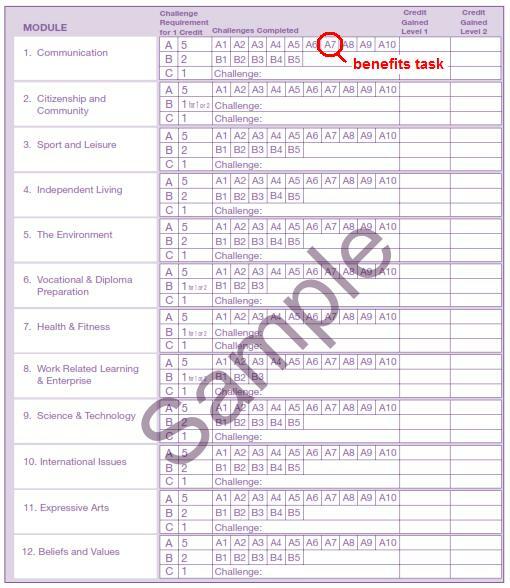 Learning which benefits unemployed individuals might be entitled to is part of the course, but is only one optional task (out of ten) in one optional section (out of three) in one optional module (out of twelve). This is one example of 'Chinese whispers' that needs to be put to bed. Have apprenticeships doubled under the Coalition?